The problem with politically-correct myth of Islam is that it is a system of explaining things that does not consider the cold, hard numbers. 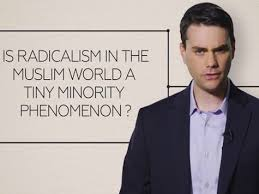 Ben Shapiro provides the following hard numbers in debunking the myth of the tiny radical Muslim minority in the video provided at the bottom of this blog. Then he lays the groundwork by stating, “There are 1.6 billion Muslims on the planet, living in 49 countries. All the stats are from Pew Research as of 2011.” He then provides the following numbers showing that the radicalism is vastly under-estimated. If these percentages are extrapolated to the uncounted nations (Syria, Saudi Arabia, Lybia, etc. ), over half of Muslims fall into the radical Muslim category. That is a majority, not a minority; therefore, that makes the “minority of radical Muslims” nothing but a myth. Next Post IRS chief: "Whenever we can, we follow the law"